Australia's biggest annual celebration of beer returns in May 2017, with Good Beer Week again bringing more than 250 diverse events to breweries, bars, restaurants, a farm and more from May 12 to 21. 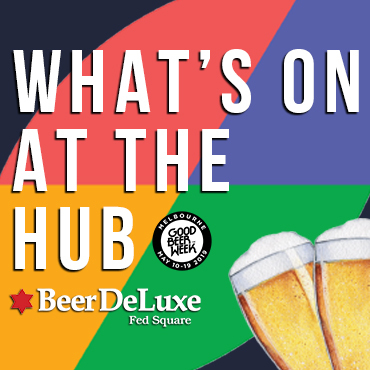 The not for profit festival kicks off with the Official Launch Party at the Festival Hub, Beer DeLuxe in Fed Square, on the evening of May 12. Over the following ten days, you'll be able to enjoy gigs and guest brewers, demonstrations and degustations, opera, circus and more. The Crafty Pint's pocket of Good Beer Week, Pint of Origin is back for a sixth time in Melbourne, nudging ever further into the north and south of the city – look out for three suggested mini PoO Crawls on this site in the lead up to the festival and prepare to pick up passports to help guide you between the venues. On the Thursday of the week, the Gala Dinner for the 25th Australian International Beer Awards takes place while GABS returns to the Royal Exhibition Building over the final weekend. There's also the Cryermalt Trade Hub all week upstairs at Beer DeLuxe and it's best to keep an eye on social media for unannounced pop-up events all over the city all week.